Jeep TJ front bumpers in stock! The main bar is made from 1.75" X .120 wall tubing. The upper bar and vertical supports are made from 1.5" tubing . Upper bar includes two mounts for off-road lights on top of the bumper . D-Ring mounts are provided below the man bar . D-Ring shackles are available separately . Bumpers are powder coated gloss black and ready for installation . Includes 3/16" bolt-on skid plate and hardware . Overall Bumper width is 43". Fits 1997 - 2006 Jeep TJ and Rubicon Models . Note: Bumper not rated for towing. 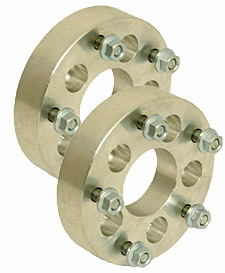 ALUMINUM JEEP WHEEL SPACERS . These bolt-on wheel spacers are designed to give you a little more width without changing out your axle for a wider one . Features safety graded studs and matching nuts for proper fit . Spacers are 1.25" and 1.5" thick . Made from Billet 6061-T6 aluminum . Grade 8 Studs , Grade 10.9 nuts . Only high quality nuts and studs that are hardness graded and stamped are used . Spacers feature precision machined surfaces for proper fit and contact with wheels and hubs . Wheel Spacers, 1.25" wide, 5x4.5"
Wheel Spacers, 1.25" wide, 5x5.5"
Wheel Spacers, 1.50" wide, 5x4.5"
Wheel Spacers, 1.50" wide, 5x5.5"
Wheel Spacers, 2" wide, 5x4.5"
Wheel Spacers, 2" wide, 5x5.5"
We now carry OMC Rock Krusher series Rock Sliders for XJ's .They are designed to work with most Long Arm kits and are made from 3/16 plate, and .120 wall dom with 15 mounting points per side . They are a complete bolt on with thread certs and all grade 8 hardware included. This;bumper is designed for use with WARN winches. Stinger and light bar are optional. This bumper includes 1/2" D-Ring tabs and is made from 3/16 plate and 3/8 plate for the winch. This is a great looking bumper designed to protect and enhance the approach angle of your Jeep Cherokee or Comanche. NOTE: This bumper ships UNPAINTED and raw.